Accelerated Baby: I miss wine. Seriously. This may be the hardest thing to give up for me during pregnancy. Does that make me awful? Remember that time we drank wine at every meal in Italy? Swoon. Seriously, even our continental breakfast included mimosas. TAKE ME BACK THERE. 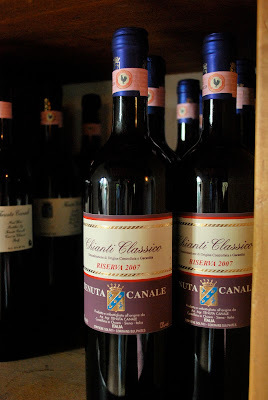 I still have a bottle of this Chianti Classico waiting for a celebratory toast after Baby G arrives. But, since I cannot drink while pregnant, and yes, I realize that I can only drink teensy amounts when nursing (for more info see here), I have had to console myself in other ways. Cooking with wine, for example. I have become the Risotto Queen. I love the smell of wine reducing in a hot pan. Yummmm. It is almost like drinking it. Right? RIGHT? When A came home from work, I was just putting the finishing touches on this and some steamed broccoli. He hopped in the shower and came back down for dinner. The bottle of wine used for the risotto happened to still be sitting out on the counter. "Honey, you don't mind if I have a glass of that wine with dinner do you?" And, because I am an amazingly gracious and loving wife, I of course replied, "Not at all dear, go right ahead." This is where I admit that I am a dirty, dirty liar. "Hell yes I mind! Are you f-ing kidding me right now?!" Delivered with a look that could rival Medusa on her best day. He had the decency to look a little surprised and chagrined as he put the wine glass back in the cabinet and reached instead for the milk. ...and I also made this last night, with stellar reviews from the crowd. I mean, if I can't drink wine, I might as well overindulge in some carbs, amiright? i don't really drink to begin with, but most pregnant women I know have a half glass of wine with dinner in the third trimester. in the united states, they tell women to not drink at all even though there is no indication that mild/moderate drinking causes fetal alcohol syndrome. women in europe drink every day and their FAS rates are no higher than ours. I am not trying to peer pressure you into drinking, I am just saying if you decided to have a half glass to help you relax at the end of a rough day nothing bad will happen. and no one would have any business judging you. You need to calm down, let A have a glass of wine to compliment your meal. Now if he drank the bottle that would be different. love you.